- Why do we need to keep our heads up in 1v1 situations? To observes the defender, and look at the space available behind the defender. - What do we do once we've unbalanced the defender? Quickly change direction and accelerate past the defender towards goal or space we intend on attacking. - Encourage players to dribble and take players on when space is available. Organization: 20x20 Grid with rings and cones or mannequines inside as shown in the diagram. Instruction: Players dribble inside the grid and dribble in a figure 8 around the rings, slalom through the cones and or mannequines. Dribble using: Right Foot only, Left only, Inside of both feet only, Outside of both feet only, sole roles. Jump from one ring to the other holding the ball between feet, and through the cones roll with the sole across the body to tap with inside of other foot. Organization: 20x30 grid split into 2 as shown. Equipment required poles for gates or cones, 4 gates at each end, agility ladder or hurdles and cones for weaving. Instructions:Set up area as shown in the diagram. Split groups into teams and have them line up as shown in the digram. Attackers start by dribbling slalom through the 3 cones, while the defender performs exercise through agility ladder or hurdles. Players compete in a 1v1 and attemp to dribble through either of the 2 gates to score. 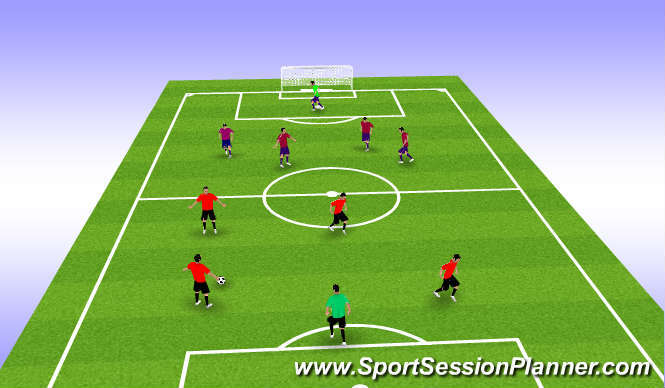 - Players passes into partner after dribbling through the cones and becomes the defender. 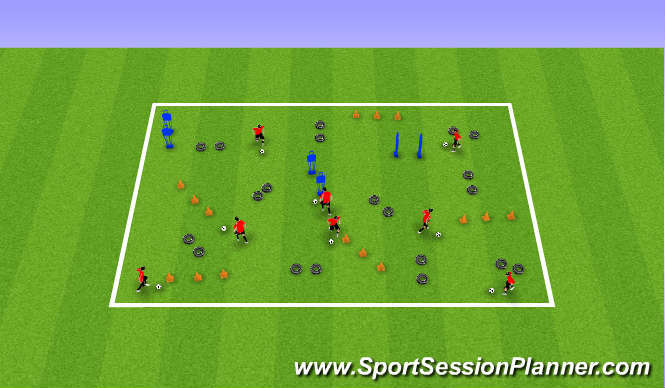 Organization: 1 net, 1 GK, 1 Mannequin and cones or slalom pole 10-12 Balls. Instructions: 4 players maximum per station. 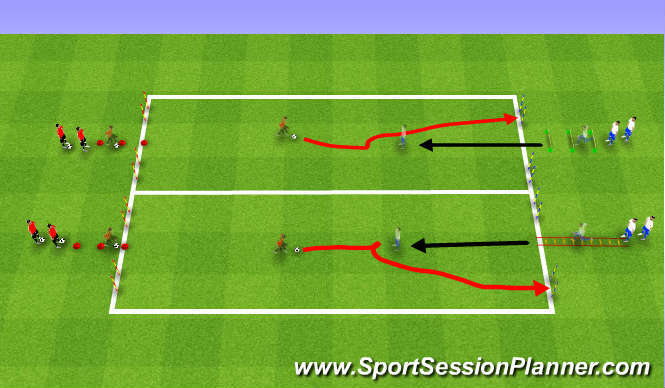 Players take turns dribbling through cones, take a touch to attack mannequin feint and take a shot on goal.